You didn’t have to be around in the 70’s to appreciate the sheer audacity of the classic muscle cars. This 1970 Boss 302 inspires a gut reaction up close, especially if you’ve heard it roar. The psychedelic swirls produced by interlocking concentric oval shapes remind us of another simpler, more innocent time but gives the feeling of a dynamic machine ready to leap off the canvas too. 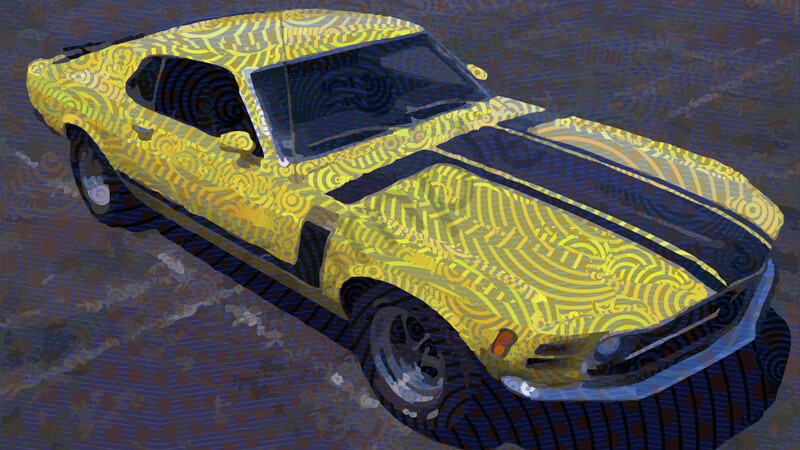 Artist Peter McClard's subject matter for this beautiful algorithmic art piece is the Mustang Boss 302 which is a high-performance variant of the Ford Mustang originally produced by Ford in 1969 and 1970, alongside its more powerful sibling the Boss 429 Mustang. It was produced for the Trans Am racing series. Ford revived the name for another two year production run in 2012 and 2013.